Is the colour of 620 nm light and 780 nm light same? Is the colour of 620 nm light and 621 nm light same? How many colours are there in white light? White light is a composition of seven colours. These are violet, indigo, blue, green, yellow, orange and red, collectively known as VIBGYOR. Spectrum of white light consists of sever colour bands. Each band consists of some range of wavelengths or frequencies. So, the colour of 620 nm and 780 nm lights may be different. But the colour of 620 nm light and 621 nm light is same. λ=λ0/μ=540 nm. To a person under water, does this light appear green? Colour of light will depend only on the frequency of light and not on the wavelength of the light. So, light will appear red to an observer under water. Will the diffraction effects from a slit be more or less clearly visible if the slit-width is increased? The width of the central band is inversely proportional to the slit width. So, as the width of the slit is increased, the central band will become less wider and further bands will start merging in them. Hence, diffraction effects will be visible less clearly. If we put a cardboard (say 20 cm × 20 cm) between a light source and our eyes, we can’t see the light. But when we put the same cardboard between a sound source and out ear, we hear the sound almost clearly. Explain. Light waves have the property of travelling in a straight line, unlike sound waves. When we put a cardboard between the light source and our eyes, the light waves are obstructed by the cardboard and cannot reach our eyes, which doesn’t happen when the cardboard is inserted between sound source and our ear. TV signals broadcast by a Delhi studio cannot be directly received at Patna, which is about 1000 km away. But the same signal goes some 36000 km away to a satellite, gets reflected and is then received at Patna. Explain. To receive TV signals transmitted from Delhi in Patna directly, one has to use antennas of great height, which will cost much. On the other hand, transmission of signals with the help of satellites requires only high frequency waves and can be done easily. Can we perform Young’s double slit experiment with sound waves? To get a reasonable “fringe pattern”, what should be the order of separation between the slits? How can the bright fringes and the dark fringes be detected in this case? Young’s double slit experiment can be performed with sound waves, as the sound waves also show interference pattern. To get a reasonable “fringe pattern”, the separation of the slits should be of the order of the wavelength of the sound waves used. In this experiment, the bright and dark fringes can be detected by measuring the intensity of sound using a microphone or any other detector. Is it necessary to have two waves of equal intensity to study interference pattern? Will there be an effect on clarity if the waves have unequal intensity? Interference pattern can be studied with waves of unequal intensity. In case of waves of unequal intensities, the contrast will not be clear, as the minima will not be completely dark. Can we conclude from the interference phenomenon whether light is a transverse wave or a longitudinal wave? The interference pattern can be produced by any two coherent waves moving in the same direction. It cannot be concluded from the interference phenomenon that light is a transverse wave, as sound waves that are longitudinal in nature also interfere. Why don’t we have interference when two candles are placed close to each other and the intensity is seen on a distant screen? What happens if the candles are replaced by laser sources? In order to get interference, the sources should be coherent, i.e. they should emit wave of the same frequency and a stable phase difference. Two candles that are placed close to each other are distinct and cannot be considered as coherent sources. Two independent sources cannot be coherent. So, two different laser sources will also not serve the purpose. If the separation between the slits in a Young’s double slit experiment is increased, what happens to the fringe-width? If the separation is increased too much, will the fringe pattern remain detectable? The fringe width in Young’s double slit experiment depends on the separation of the slits. λ=wavelengthχ=fringe widthD=distance between slits and screend=separation between slitsOn increasing d, fringe width decreases. If the separation is increased too much, the fringes will merge with each other and the fringe pattern won’t be detectable. Suppose white light falls on a double slit but one slit is covered by a violet filter (allowing λ = 400 nm). Describe the nature of the fringe pattern observed. The violet filter will allow only violet light to pass through it. Now, if the double slit experiment is performed with the white light and violet light, the fringe pattern will not be the same as obtained by just using white light as the source. To have interference pattern, the light waves entering from the slits should be monochromatic. So, in this case, the violet light will superimpose with only violet light (of wavelength 400 nm) in such a way that the bright bands will be of violet colour and the minima will be completely dark. Light shows photoelectric effect and Compton effect, which depicts its particle nature. It also shows interference and diffraction, which depicts the wave nature of light. The speed of light in any medium depends on the refractive index of that medium, which is an intensive property. Hence, speed of light is not affected by the elasticity and inertia of the medium. Light consists of mutually perpendicular electric and magnetic fields. So, the equation of a light wave is represented by its field vector. Which of the following properties shows that light is a transverse wave? Reflection, interference and diffraction are the phenomena shown by both transverse waves and longitudinal waves. Polarization is the phenomenon shown only by transverse waves. Frequency of a light wave, as it travels from one medium to another, always remains unchanged, while wavelength decreases. Frequency of a light wave doesn’t change on changing the medium of propagation of light. Which of the following sources provides the best monochromatic light? Among the given sources, laser is the best coherent source providing monochromatic light with constant phase difference. Wave travelling from a distant source always has plane wavefront. Intensity of a point source obeys the inverse square law. where S is the source strength. For light waves emitted by two sources of light to remain coherent, the initial phase difference between waves should remain constant in time. If the phase difference changes continuously or randomly with time, then the sources are incoherent. Interference effect is produced by a thin film ( coating of a thin layer of a translucent material on a medium of different refractive index which allows light to pass through it))In the present case, oil floating on water forms a thin film on the surface of water, leading to the display of beautiful colours in daylight because of the interference of sunlight. The wavelength of sodium light in air is 589 nm. (a) Find its frequency in air. (b) Find its wavelength in water (refractive index = 1.33). (c) Find its frequency in water. (d) Find its speed in water. λw is the wavelength of sodium light in water. ⇒11.33=λω589×10-9⇒ λω=443 nm(c) Frequency of light does not change when light travels from one medium to another. νω and speed in air, va = c.
The index of refraction of fused quartz is 1⋅472 for light of wavelength 400 nm and is 1⋅452 for light of wavelength 760 nm. Find the speeds of light of these wavelengths in fused quartz. Refractive index of fused quartz for light of wavelength 400 nm is 1.472. And refractive index of fused quartz for light of wavelength 760 nm is 1.452. Speed of light in vacuumSpeed of light in the material=cvLet speed of light for wavelength 400 nm in quartz be v400. 1.472=3×108v400⇒v400=2.04×108 m/sLet speed of light of wavelength 760 nm in quartz be v760. The speed of yellow light in a certain liquid is 2⋅4 × 108 m s−1. Find the refractive index of the liquid. μL=3×1082.4×108=1.25Hence, the required refractive index is 1.25. 5·0×10-7 m. The interference pattern is observed on a screen placed at a distance of 1⋅0 m. (a) Find the separation between consecutive maxima. Can you expect to distinguish between these maxima? (b) Find the separation between the sources which will give a separation of 1⋅0 mm between consecutive maxima. We know that separation between two consecutive maxima = fringe width (β). Total intensity coming from the source is I0 which is present at the central maxima. In case of two slits, the intensity is getting distributed between the two slits and for a single slit, the amplitude of light coming from the slit is reduced to half which leads to 1/4th of intensity. On the introduction of a transparent sheet in front of one of the slits, the fringe pattern will shift slightly but the width will remain the same. λΜ=λ/ηλΜ=wavelength in mediumλ=wavelength in vacuumη=refractive index of mediumHence, fringe width decreases when Young’s double slit experiment is performed under water. Light is an electromagnetic wave that can travel through vacuum or any optical medium. Which of the following properties of light conclusively support the wave theory of light? (a) Light obeys the laws of reflection. (b) Speed of light in water is smaller than its speed in vacuum. (d) Light shows photoelectric effect. Snell’s Law, which states that the speed of light reduces on moving from a rarer to a denser medium, can be concluded from Huygens’ wave theory and interference of light waves is based on the wave properties of light. (c) are perpendicular to the direction of propagation of light. Light is an electromagnetic wave that propagates through its electric and magnetic field vectors, which are mutually perpendicular to each other, as well as to the direction of propagation of light. The average value of both the fields is zero. Huygen’s wave theory explains the origin of points for the new wavefront proceeding successively. It also explains the variation in speed of light on moving from one medium to another, i.e. it proves Snell’s Law. Three observers A, B and C measure the speed of light coming from a source to be νA, νB and νC. A moves towards the source and C moves away from the source at the same speed. B remains stationary. The surrounding space is vacuum everywhere. 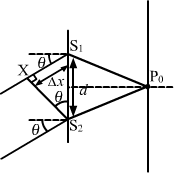 νB=12vA+vC. This expression also implies that vA = vB = vC. Suppose the medium in the previous question is water. Select the correct option(s) from the list given in that question. v=c/η, where η is the refractive index of the medium and according to Doppler effect, for an observer moving towards the source ,speed of light appears to be more than the other two cases. On the other hand, it will be least when the observer is moving away from the source. Light waves travel in vacuum along the X-axis. Which of the following may represent the wave fronts? â€‹The wave is travelling along the X-axis. So, it’ll have planar wavefront perpendicular to the X-axis. Wavelength of red light is greater than wavelength of violet light; so, the fringe width will reduce. A Young’s double slit experiment is performed with white light. (a) The central fringe will be white. (b) There will not be a completely dark fringe. (c) The fringe next to the central will be red. (d) The fringe next to the central will be violet. The superposition of all the colours at the central maxima gives the central band a white colour. As we go from the centre to corner, the fringe colour goes from violet to red. There will not be a completely dark fringe, as complete destructive interference does not take place. The waves are travelling with the same frequencies and varying by constant phase difference. The separation between the consecutive dark fringes in a Young’s double slit experiment is 1⋅0 mm. The screen is placed at a distance of 2⋅5 m from the slits and the separation between the slits is 1⋅0 mm. Calculate the wavelength of light used for the experiment. Let the wavelength of the light used in experiment be λ. 10-3 m=2.5×λ10-3⇒λ=12.5 10-6 m =4×10-7 m=400 nmHence, the wavelength of light used for the experiment is 400 nm. In a double slit interference experiment, the separation between the slits is 1⋅0 mm, the wavelength of light used is 5⋅0 × 10−7 m and the distance of the screen from the slits is 1⋅0 m. (a) Find the distance of the centre of the first minimum from the centre of the central maximum. (b) How many bright fringes are formed in one centimetre width on the screen? In a Young’s double slit experiment, two narrow vertical slits placed 0⋅800 mm apart are illuminated by the same source of yellow light of wavelength 589 nm. How far are the adjacent bright bands in the interference pattern observed on a screen 2⋅00 m away? ⇒β=589×10-9×20.8×10-3 =1.47×10-3 m =1.47 mm.Hence, the adjacent bright bands in the interference pattern are 1.47 mm apart. d=2×10-3 m,Let angular separation between the consecutive bright fringes be θ. Using θ= βD=λDdD=λd, we get: θ=500×10-92×10-3 =250×10-6 =25×10-5 radian or 0.014°Hence, the angular separation between the consecutive bright fringes is 0.014 degree. A source emitting light of wavelengths 480 nm and 600 nm is used in a double-slit interference experiment. The separation between the slits is 0⋅25 mm and the interference is observed on a screen placed at 150 cm from the slits. Find the linear separation between the first maximum (next to the central maximum) corresponding to the two wavelengths. Let the separation between the slits be d and distance between screen from the slits be D.
Suppose, the mth bright fringe of violet light overlaps with the nth bright fringe of red light. nλrDdFor overlapping, yv = yr .
7thbright fringe of violet light overlaps with the 4th bright fringe of red light. It can also be seen that the 14th violet fringe will overlap with the 8th red fringe. Find the thickness of a plate which will produce a change in optical path equal to half the wavelength λ of the light passing through it normally. The refractive index of the plate is μ.
λ. Neglect any absorption of light in the plate. Refractive index of the plate is μ. The thickness of the plate is t.
Wavelength of the light is λ. (b) For zero intensity at the centre of the fringe pattern, there should be distractive interference at the centre. A transparent paper (refractive index = 1⋅45) of thickness 0⋅02 mm is pasted on one of the slits of a Young’s double slit experiment which uses monochromatic light of wavelength 620 nm. How many fringes will cross through the centre if the paper is removed? And optical path should be changed by λ for the shift of one fringe. n=μ-1tλ =1.45-1×0.02×10-3620×10-9 =14.5Hence, 14.5 fringes will cross through the centre if the paper is removed. In a Young’s double slit experiment, using monochromatic light, the fringe pattern shifts by a certain distance on the screen when a mica sheet of refractive index 1⋅6 and thickness 1⋅964 micron (1 micron = 10−6 m) is introduced in the path of one of the interfering waves. The mica sheet is then removed and the distance between the screen and the slits is doubled. It is found that the distance between the successive maxima now is the same as the observed fringe-shift upon the introduction of the mica sheet. Calculate the wavelength of the monochromatic light used in the experiment. t=1.964 micron=1.964×10-6 mLet the wavelength of the light used = λ.
n=μ-1tλSo, the corresponding shift in the fringe width equals the number of fringes multiplied by the width of one fringe. β=λD’d=λ2DdAccording to the question, fringe shift in first case = fringe width in second case. So, μ-1t×Dd=λ2Dd⇒λ=μ-1 t2 =1.6-1×1.964×10-62 =589.2×10-9=589.2 nmHence, the required wavelength of the monochromatic light is 589.2 nm. A mica strip and a polystyrene strip are fitted on the two slits of a double slit apparatus. The thickness of the strips is 0⋅50 mm and the separation between the slits is 0⋅12 cm. The refractive index of mica and polystyrene are 1.58 and 1.55, respectively, for the light of wavelength 590 nm which is used in the experiment. The interference is observed on a screen at a distance one metre away. (a) What would be the fringe-width? (b) At what distance from the centre will the first maximum be located? ⇒n=0.015×10-3590×10-9=25.43∴ 25 fringes and 0.43th of a fringe. ⇒ In which 13 bright fringes and 12 dark fringes and 0.43th of a dark fringe. Two transparent slabs having equal thickness but different refractive indices µ1 and µ2 are pasted side by side to form a composite slab. This slab is placed just after the double slit in a Young’s experiment so that the light from one slit goes through one material and the light from the other slit goes through the other material. What should be the minimum thickness of the slab so that there is a minimum at the point P0 which is equidistant from the slits? Refractive index of the two slabs are µ1 and µ2. Thickness of both the plates is t.
A thin paper of thickness 0⋅02 mm having a refractive index 1⋅45 is pasted across one of the slits in a Young’s double slit experiment. The paper transmits 4/9 of the light energy falling on it. (a) Find the ratio of the maximum intensity to the minimum intensity in the fringe pattern. (b) How many fringes will cross through the centre if an identical paper piece is pasted on the other slit also? The wavelength of the light used is 600 nm. Let a1 and a2 be corresponding amplitudes. I1I2=a12a22 ∵I∝a2⇒a1a2=32Here, a is the amplitude. λ=700 nm in vacuum. Find the fringe-width of the pattern formed on the screen. β=λωDd =525×10-9×0.480.28×10-3 =9×10-4=0.90 mmHence, fringe-width of the pattern formed on the screen is 0.90 mm. θ=sin-1 λ2dwith the normal to the plane of the slits, there will be a dark fringe at the centre P0 of the pattern. Let the two slits are S1 and S2 with separation d as shown in figure. The wave fronts reaching P0 from S1 and S2 will have a path difference of S1X = âˆ†x. 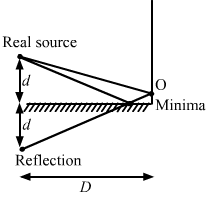 λis placed a distance d above a large plane mirror, as shown in the figure (17-E1). The light coming directly from the slit and that coming after the reflection interfere at a screen ∑ placed at a distance D from the slit. (a) What will be the intensity at a point just above the mirror, i.e. just above O? (b) At what distance from O does the first maximum occur? π’ from the light directly coming from the source. π, which is the condition of distractive interference. So, the intensity at a point just above the mirror is zero. A long narrow horizontal slit is paced 1 mm above a horizontal plane mirror. The interference between the light coming directly from the slit and that after reflection is seen on a screen 1⋅0 m away from the slit. Find the fringe-width if the light used has a wavelength of 700 nm. It is a case of Lloyd’s mirror experiment. Fringe width, β=λDd’ =700×10-9×12×10-3 =0.35×10-3 m=0.35 mmHence, the width of the fringe is 0.35 mm. Consider the situation of the previous problem. If the mirror reflects only 64% of the light energy falling on it, what will be the ratio of the maximum to the minimum intensity in the interference pattern observed on the screen? The mirror reflects 64% of the energy or intensity of light. Let intensity of source = I1. And intensity of light after reflection from the mirror = I2. Let a1 and a2 be corresponding amplitudes of intensity I1 and I2. We know that ImaxImin=a1+a22a1-a22 =5+425-42Imax:Imin=81 : 1Hence, the required ratio is 81 : 1.
λ. The slits are separated by a distance d. A plane mirror is placed in front of the double slit at a distance D1 from it and a screen ∑ is placed behind the double slit at a distance D2 from it (figure 17-E2). The screen ∑ receives only the light reflected by the mirror. Find the fringe-width of the interference pattern on the screen. Distance between the slit and mirror is D1. Distance between the slit and screen is D2. White coherent light (400 nm-700 nm) is sent through the slits of a Young’s double slit experiment (figure 17-E3). The separation between the slits is 0⋅5 mm and the screen is 50 cm away from the slits. There is a hole in the screen at a point 1⋅0 mm away (along the width of the fringes) from the central line. (a) Which wavelength(s) will be absent in the light coming from the hole? (b) Which wavelength(s) will have a strong intensity? yn=1 mm=1×10-3 m(a) The wavelength(s) will be absent in the light coming from the hole, which will form a dark fringe at the position of hole. ⇒λn=22n+1 yndD =22n+1×10-3×0.05×10-30.5 =22n+1×10-6 m =22n+1×103 nm For n=1,λ1=23×1000 =667 nmFor n=2,λ2=25×1000=400 nmThus, the light waves of wavelength 400 nm and 667 nm will be absent from the light coming from the hole. (b) The wavelength(s) will have a strong intensity, which will form a bright fringe at the position of the hole. So, yn=nλnDd⇒λn=yndnDFor n=1, λ1=yndD =10-3×0.5×10-30.5 =10-6 m=1000 nm.But 1000 nm does not fall in the range 400 nm − 700 nm. Again, for n=2,λ2=ynd2D=500 nmSo, the light of wavelength 500 nm will have strong intensity. Consider the arrangement shown in the figure (17-E4). The distance D is large compared to the separation d between the slits. 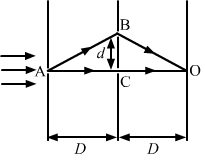 (a) Find the minimum value of d so that there is a dark fringe at O. (b) Suppose d has this value. Find the distance x at which the next bright fringe is formed. (c) Find the fringe-width. dmin=λD2there is a dark fringe at O. 2λ. Consider a line passing through S2 and perpendicular to the line S1 S2. What is the smallest distance from S2 where a minimum intensity occurs? Let P be the point of minimum intensity. Z=7λ12is the smallest distance for which there will be minimum intensity. d=2λD/3. (b) Show that the intensity at P0 is three times the intensity due to any of the three slits individually. λ29, as it has a very small value. ∴d=2λD3(b) To calculating the intensity at P0, consider the interference of light waves coming from all the three slits. ϕc=2π∆xCλ=2π×4λ3λ⇒ϕc=8π3 or 2π+2π3⇒ϕc=2π3 …(1)Again, ϕB=2π ∆xBλ⇒ϕB=2πλ3λ=2π3 …(2)So, it can be said that light from B and C are in the same phase, as they have the same phase difference with respect to A.
A=2a2+a2+2a×acos2π3 =4a2+a2+2a23∴lpo=K 3 r2=3 Kr2=3lHere, I is the intensity due to the individual slits and Ipo is the total intensity at P0. Thus, the resulting amplitude is three times the intensity due to the individual slits. In a Young’s double slit experiment, the separation between the slits = 2⋅0 mm, the wavelength of the light = 600 nm and the distance of the screen from the slits = 2⋅0 m. If the intensity at the centre of the central maximum is 0⋅20 W m−2, what will be the intensity at a point 0⋅5 cm away from this centre along the width of the fringes? A=a2+a2+2a2 cos 2π3 =a2+a2-a2 =aSimilarly, the amplitude of the resulting wave at the centre is 2a. Let the intensity of the resulting wave at point y = 0.5 cm be I. Since IImax=A22a2, we have:I0.2=A24a2=a24a2⇒I=0.24=0.05 W/m2Thus, the intensity at a point 0.5 cm away from the centre along the width of the fringes is 0.05 W/m2. λ. Find the distance from the central point where the intensity falls to (a) half the maximum, (b) one-fourth the maximum. Let Imax be the maximum intensity and I be the intensity at the required point at a distance y from the central point. ϕis the phase difference in the waves coming from the two slits. IImax=14⇒4a2cos2ϕ2=14⇒cos2 ϕ2=14⇒cosϕ2=12⇒ϕ2=π3So, corrosponding path difference, ∆x=λ3and position, y=∆xDd=λD3d . λ=500 nm, d=1·0 mm and D=1·0 m. Find the minimum distance from the central maximum for which the intensity is half of the maximum intensity. D=1 mLet Imax be the maximum intensity and I be the intensity at the required point at a distance y from the central point. λ, d and D where the symbols have their usual meanings. DLet Imax be the maximum intensity and I be half the maximum intensity at a point at a distance y from the central point. ⇒IImax=12⇒4a2cos2ϕ24a2=12⇒cos2ϕ2=12⇒cosϕ2=12⇒ϕ2=π4⇒ϕ=π2Corrosponding path difference, ∆x=14⇒y=∆xDd=λD4dThe line-width of a bright fringe is defined as the separation between the points on the two sides of the central line where the intensity falls to half the maximum. At S3, the path difference is zero. So, the maximum intensity occurs at amplitude = 2a. The first minima occurs at S4, as shown in figure (a). The first maxima occurs at S4, as shown in the figure. The slit S4 falls at the mid-point of the central maxima and the first minima, as shown in the figure. Fours slits S1, S2, S3 and S4. The separation between slits S3 and S4 can be changed. Point P is the common perpendicular bisector of S1S2 and S3S4. i.e. dark fringes are formed at S3 and S4. So, the intensity of light at S3 and S4 is zero. Hence, the intensity at P is also zero. ∆x=ydD=3λD4d×dD=3λ4Hence, the intensity at P is I.
the intensity at P is 2I. A soap film of thickness 0.0011 mm appears dark when seen by the reflected light of wavelength 580 nm. What is the index of refraction of the soap solution if it is known to be between 1.2 and 1.5? λ=580 nm=580×10-9 mLet the index of refraction of the soap solution be μ.
n=5So, μ=0.132×10=1.32Therefore, the index of refraction of the soap solution is 1.32. A parallel beam of light of wavelength 560 nm falls on a thin film of oil (refractive index = 1.4). What should be the minimum thickness of the film so that it strongly reflects the light? μ=1.4Let the thickness of the film for strong reflection be t.
2μt=2n+1λ2⇒t=2n+1λ4μwhere n is an integer. t=λ4μ =560×10-94×1.4 =10-7m=100 nmTherefore, the minimum thickness of the oil film so that it strongly reflects the light is 100 nm. A parallel beam of white light is incident normally on a water film 1.0 × 10−4 cm thick. Find the wavelengths in the visible range (400 nm − 700 nm) which are strongly transmitted by the film. Refractive index of water = 1.33. ⇒ λ=2×1.33×10-6n =2660×10-9n mPutting n = 4, we get, λ1 = 665 nm. Putting n = 5, we get, λ2 = 532 nm. Putting n = 6, we get, λ3 = 443 nm. Therefore, the wavelength (in visible region) which are strongly transmitted by the film are 665 nm, 532nm and 443 nm. A glass surface is coated by an oil film of uniform thickness 1.00 × 10−4 cm. The index of refraction of the oil is 1.25 and that of the glass is 1.50. Find the wavelengths of light in the visible region (400 nm − 750 nm) which are completely transmitted by the oil film under normal incidence. λ=400×10-9 to 750×10-9 mRefractive index of oil, μoil, is 1.25 and that of glass, μg, is 1.50.
λ=2μdn+12 =2×10-6×1.25×22n+1 =5×10-6 2n+1 m⇒ λ=50002n+1 nmWhere n is an integer. λ=50002×5+1 =500011=454.5 nmThus the wavelengths of light in the visible region (400 nm − 750 nm) which are completely transmitted by the oil film under normal incidence are 714 nm, 556 nm, 455 nm. Plane microwaves are incident on a long slit of width 5.0 cm. Calculate the wavelength of the microwaves if the first diffraction minimum is formed at θ = 30°. First diffraction minimum is formed at θ = 30°. For the first minima, we put n = 1. 5×sin30°=1×λ⇒λ=52=2.5 cmTherefore, the wavelength of the microwaves is 2.5 cm. Light of wavelength 560 nm goes through a pinhole of diameter 0.20 mm and falls on a wall at a distance of 2.00 m. What will be the radius of the central bright spot formed on the wall? R=1.22λDd =1.22×560×10-9×22×10-4 =6.832×10-3 m or=0.683 cmHence, the diameter 2R of the central bright spot on the wall is 1.37 cm. A convex lens of diameter 8.0 cm is used to focus a parallel beam of light of wavelength 620 nm. If the light is focused at a distance of 20 cm from the lens, what would be the radius of the central bright spot formed? R=1.22λDd =1.22×620×10-9×20×10-28×10-2 = 1891×10-9 m≈1.9×10-6m∴ Diameter of the central bright spot, 2R = 3.8 × 10−6 m.